View cart “Ebook Non-Melanoma” has been added to your cart. Lung cancer is the most commonly diagnosed cancer worldwide and is now the leading cause of cancer death in women—surpassing breast cancer, ovarian cancer, and uterine cancer combined. About six out of 10 lung cancer patients will die within one year of diagnosis, and about eight out of 10 people with the disease will die within two years. Overcoming Lung Cancer: The Promise of Photodynamic Therapy and Other Innovative Therapies highlights a new approach to the treatment of lung tumors, one rooted in the astounding cancer-fighting potential of Photomedicine (light-based medicine). Though the therapeutic applications of light date back many centuries, it is only within the past few decades that high-tech developments in laser technology as well as non-laser light have enabled the medical profession to realize the true healing potential of light. Overcoming Lung Cancer is divided into four parts: (1) Understanding and Treating Lung Cancer; (2) The Photomedical Approach to Lung Cancer; (3) Promising Research Directions; and (4) Long-Term Control: Lifestyle Factors for Preventing Recurrences and Sustaining Remissions. Parts 2 and 3 will likely attract the greatest attention, as these parts present the various applications of Photomedicine while also explaining how such applications can either enhance conventional treatments or compensate for some of the limitations of those treatments. Of course, no book on lung cancer is complete without addressing the insidious effects of cigarette smoking. Part 1 explains just how damaging a smoking habit can be, and why cigarettes continue to pose a major threat to public health. Currently, there are some 1.1 billion smokers worldwide, and these numbers are projected to increase to 1.9 billion by 2025. Both active and passive smoking (inhalation of the secondhand smoke produced by a smoker upon exhaling, as well as by the “sidestream” smoke that issues from a smoldering cigarette between puffs) are major risk factors for lung cancer. Beyond smoking, dietary factors and environmental pollutants are thought to amplify the risk of lung cancer for both smokers and nonsmokers alike. These other factors include excessive exposure to air pollution, lack of exercise, and excessive consumption of alcohol, red meat, fatty meats (as well as deep-fried cooking), and cured meats such as sausage or cured pork. Part 2 of Overcoming Lung Cancer focuses on photodynamic therapy, or PDT, which entails the use a photosensitizer, a substance that absorbs and transmits light’s energy in order to destroy abnormal or diseased cells. Upon exposure to laser and other forms of light, cancer cells that have taken up the photosensitizer will be destroyed. The best photosensitizers tend to become highly concentrated in cancer cells, thus ensuring the selective destruction of malignant tissues, while normal tissues are left unharmed and side effects are minimized. PDT also offers substantial advantages over radiation treatments, another very common strategy. Unlike radiotherapy, PDT’s mechanism for tumor destruction is not dependent on DNA damage. This decreases the chance of treatment resistance (as well as cross-resistance with chemotherapy) and also eliminates the chance of delayed adverse effects, such as developing a second cancer. “PDT seems to work best when integrated into a comprehensive treatment regimen that includes surgery and possibly other conventional treatments like chemotherapy, stenting, and laserthermia. The decision to use PDT falls to judgment of your oncologist, who would need to have a good working understanding of PDT principles and strategies. “Some oncologists may argue that surgery is a better treatment option than PDT for most lung cancer cases, including early-stage central lung cancer patients. However, this argument is not entirely supported by the research. To begin with, the long-term survival of patients who receive PDT is only slightly inferior to that achieved by surgery. Moreover, keep in mind that the vast majority of lung cancer patients who are referred for PDT are not suitable for surgery. This is partly because such patients often have multiple lung spots or lesions, not just a single lesion. There are many more technical reasons related to the current research, but the basic point is this: Comparing the survival outcomes of surgery versus PDT is like comparing apples and oranges. “There is little doubt that bronchosopic PDT can play a major role in the treatment of early-stage lung cancer. And in the event that a patient is unable to undergo surgery, PDT’s value could be even more pronounced. Compared with the other standard treatment options (i.e., chemotherapy and radiotherapy), PDT is better able to target specific lung lesions, and it causes far less damage to normal tissues. This results in fewer complications and a better overall quality of life. Also, PDT treatments can be given repeatedly without causing harm. “Finally, there does not appear to be any cross-resistance between PDT and chemotherapy. The term ‘cross-resistance’ refers to one type of cancer treatment conferring resistance to another type of treatment, which often happens between chemotherapy drugs, and can even occur between chemotherapy and radiotherapy. In fact, PDT has been shown to increase the efficacy of chemotherapy against lung cancer, and against other cancers as well. 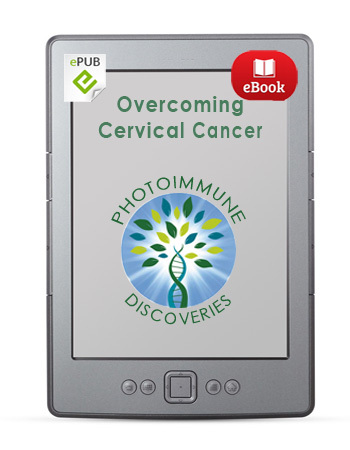 As this ebook documents, PDT has its greatest therapeutic impact on small, early-stage tumors, and in combination with conventional strategies such as surgery and radiotherapy. Adjunctive treatments such as hyperthermia (described in Part 3) could further amplify its effectiveness. There is a very strong case to be made for using PDT as a nonsurgical therapeutic option for stage I cases, as well as for inoperable non-small-cell lung cancer cases in which airway obstruction is causing breathing difficulties. Combinations of PDT with both radiotherapy and chemotherapy also have been explored. Given that lung cancer is generally viewed as a “terminal” disease—that is, a disease with an eventual outcome of death and an overall mortality rate of 98%—we at the Natural Health Foundation believe that investigations of innovative PDT-based treatment combinations to extend or optimize survival are urgently needed (see Part 3). PDT has the advantage of greater selectivity for lung cancer cells that exist as tumors, metastases, or both. It also has the potential to not only extend survival, but to improve the quality of life for patients with advanced-stage malignant disease. Part 4 highlights the salient role that diet and lifestle may have on one’s prognosis or treatment outcomes. For example, eating too many fatty foods and too few fruits and vegetables appears to have a substantial impact on the long-term outcome of lung cancer treatment. Thus, a lung cancer patient’s nutritional habits could either increase or diminish one’s risk of diseaes progression. Smoking, too, can adversely affect treatment outcomes, and this is true for other cancers too, as addressed in Part 4. 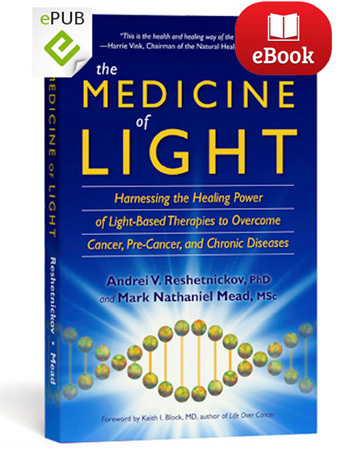 The ebook’s appendix includes a special discussion about two light-sensitizing substances, a dietary supplement called Bremachlorophyll, and a unique medicine called Bremachlorin. Because of its diverse effects against cancer, Bremachlorin-PDT is likely to revolutionize the way Photomedicine is incorporated into modern cancer treatment. Bremachlorin-PDT has already demonstrated impressive benefits for patients with lung cancer, as shown in Part 2 of this ebook.